Brands There are 316 products. Harrison Spinks is a fifth-generation family business that today has over 600 employees, from farmers who rear their prize sheep to craftsmen and women who sew, side-stitch and tuft their mattresses by hand. They specialise in creating luxurious, hand made mattresses that feature the finest fillings such as Wool, Cashmere and Mohair. They're also one of the only UK bed manufacturers that are 100% sustainable as they have their own farm, forest and even spring manufacturing supply. There are over 600 sheep on their 300 acre Yorkshire farm along with several Goats and Alpacas, these provide some of the wonderful fillings that make Harrison's mattresses so comfortable. Harrison Spinks Mattresses are a true testament to British innovation. View their award-winning range below - We have them instore to lie and try! 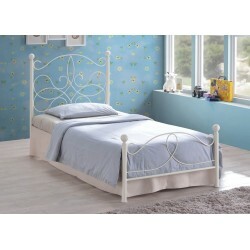 The Miami is a simple style wooden bed frame that is stunning and would enhance any bedroom.